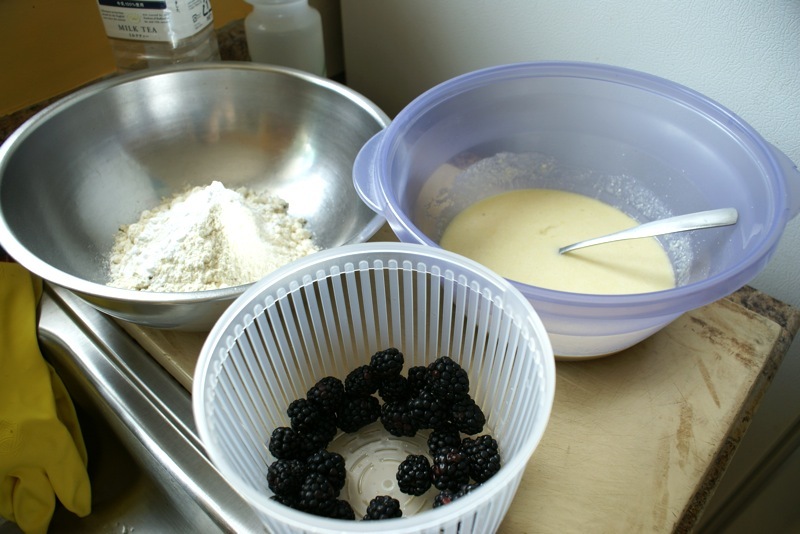 I made a gluten free cake today: a blackberry ricotta cake. 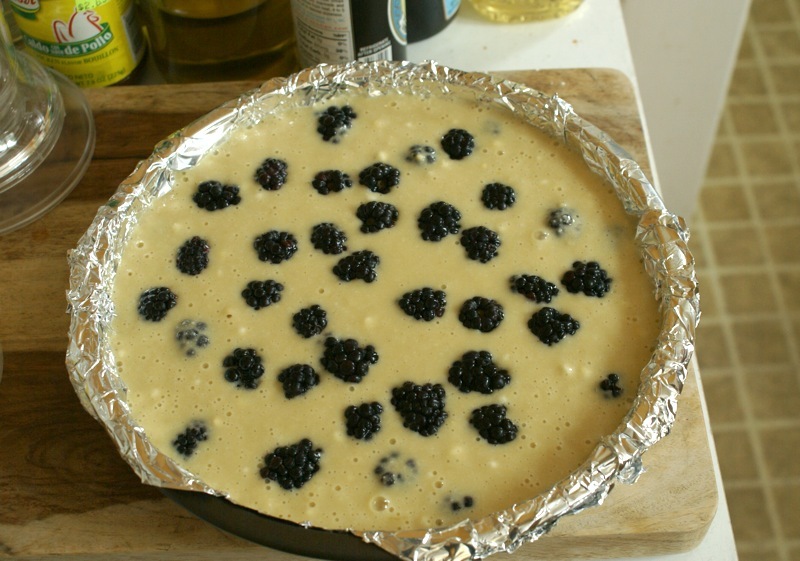 The original recipe had been for a blueberry ricotta cake with normal flour. But blueberries aren’t quite in season while blackberries are. I baked this weekend! Exciting, isn’t it? I even took pictures and edited said pictures. Anyway, my friend Tammy (whose lovely photos of some of my foods grace my food entries) was having her annual lamb dinner (with non-lamb options for people like me). Nearly all of her guests brought something to nibble on, including myself. 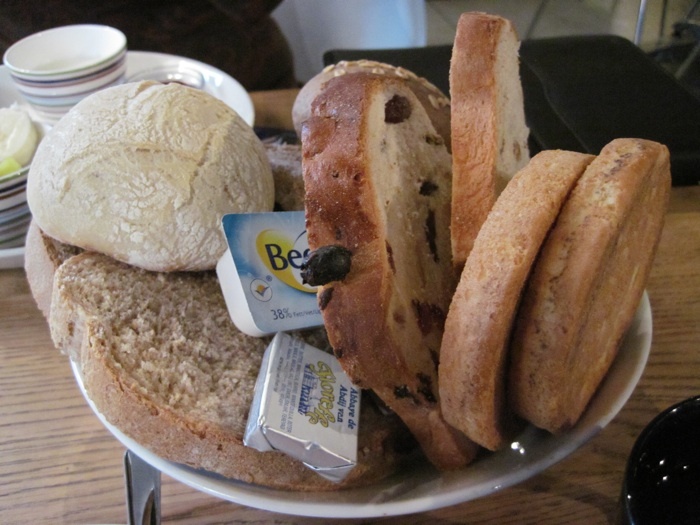 The newest cookbook that sits on my bookshelf is Warm Bread and Honey Cake by Gaitri Pagrach-Chandra. When I saw this recipe, I knew I had to make it! Pros: It came together pretty easily. Cons: My cake was half the height of the cake in the book photo! I was pretty sure that I had my eggs and butter at room temperature, and I tried really hard not to over-mix. On top of that, my syrup could have been bolder. I think I might try cake flour next time and see if it gives a better result. However, please don’t think this means that this was a bad cake! 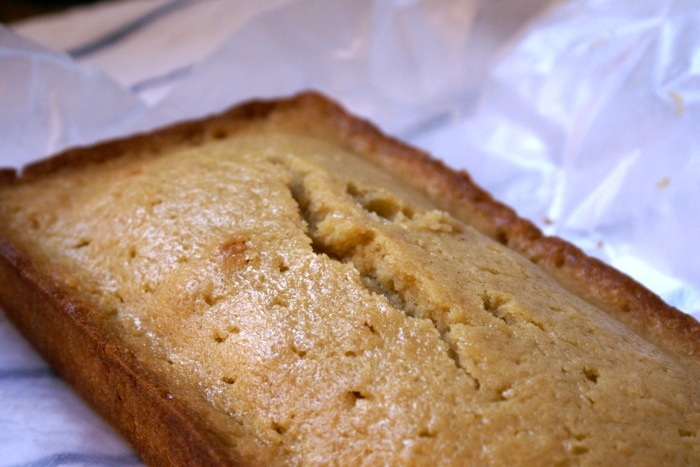 For a total experiment, it still yielded pretty tasty results (and it was not too sweet, thankfully). Preheat oven to 325F. Grease a 1-lb loaf pan. Mix flour, baking powder, salt and nutmeg. Sift this. In a separate bowl, beat the butter until smooth. Add the sugar, and beat until creamed and fluffy. 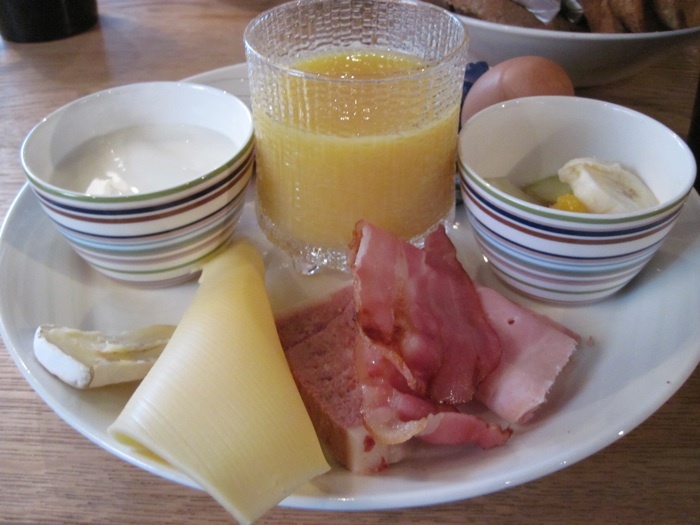 Whisk the eggs loosely in a small bowl with the vanilla. Add the egg to the butter mixture bowl in two batches, beating well and scraping down the sides of the bowl. Then use a whisk to fold in the flour mixture in three batches, alternating with milk. Pour into the loaf pan, and bake for 40-45 minutes (or until a tester is inserted and comes out clean). Remove the pan from the oven, and poke several small holes into the cake (making sure to poke all the way through to the bottom). Slowly pour the syrup over the cake. Let it cool about 5 minutes, then remove the cake from the pan. Let the cake cool completely on a wire rack. After that, wrap the cake well in plastic wrap and let the flavors meld for a day before serving. Put 1 1/4 cup granulated sugar, 3/4 cup water, and 1 tsp lemon juice into a small saucepan. Bring to a boil, stirring constantly, until sugar is dissolved. Reduce the heat and let simmer for 5 minutes. Take the pan off the heat and let it cool about 5 minutes. Add orange blossom water to your liking (I ended up using 1 1/2 Tbsp for the cake… but I now think that it should be 2-3 Tbsp). Use the syrup on cake, in tea, and anything else that suits your fancy! It’s probably a good thing for this blog that I’m friends with Tammy. 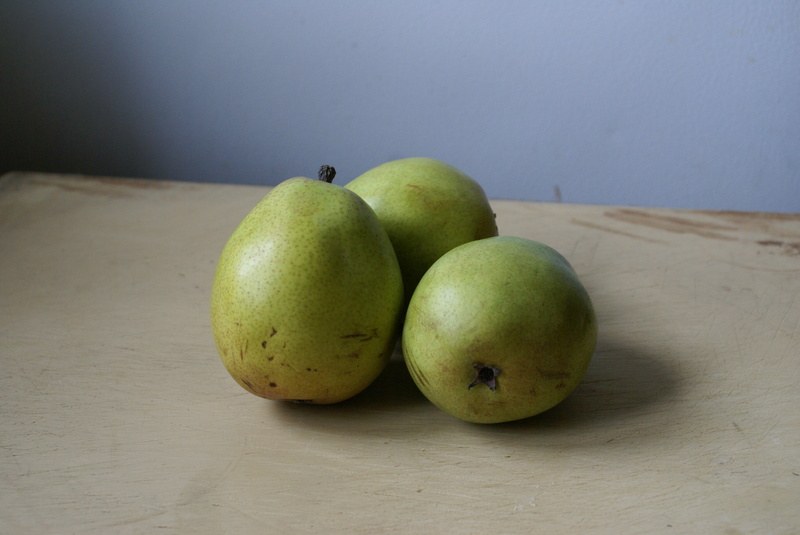 Since the original co-conspirators of this blog have moved onto different places and hobbies, I think it got a bit lonely around here without people to talk to about cooking. Plus, she takes lovely food photos. Anyway, I was at Tammy’s house on Friday and I made three pizzas from scratch for us and some friends. They were roasted garlic pizza with garlic sauce, bell pepper/monterey jack cheese pizza with red sauce, and fig pizza with garlic sauce. 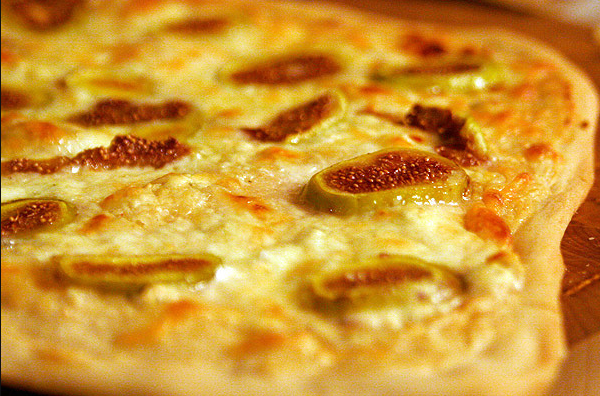 Tammy took a lovely photo of the fig pizza, so that’s the recipe that you’ll get today. I always make my own pizza dough now. So far, my favorite pizza dough recipe comes from Sarah Moulton. For Friday, I had modified it to suit my mood, but it’s a pretty solid recipe regardless. In a large bowl whisk together 3/4 cup of flour, yeast, sugar, and 2/3 cup hot water (this is about 130 degrees F according to Sarah – I just used hot water from the tap but I recommend taking the temperature of your hot water from the tap so that you can file it for future reference – you can go below 130F without any harm but don’t go over 130F or you risk killing your yeast). Stir in the oil, 1 1/4 cups of the remaining flour, and the salt and blend the mixture until it forms a dough. Knead the dough on a floured surface, incorporating as much of the remaining 1/4 cup flour as necessary to prevent the dough from sticking, for 5 to 10 minutes, or until it is smooth and elastic. For the white garlic sauce, I tried my hand at an Emeril Lagasse recipe. Pre-heat your oven to 350F. Chop off the top of the garlic head to expose the top of the garlic cloves. Rub with cut side with some oil, and put the garlic head on a pan with the cut side down. Bake it in the oven for about an hour. Then, take it out and let it cool enough for you to handle. Remove the garlic cloves, and set aside. Transfer to a small bowl and cool slightly, placing a piece of plastic wrap directly on the surface to prevent a skin from forming. Now, onto the pizza! You will need slice figs (green or black), some gorgonzola cheese, some mozzarella cheese, and some white truffle oil (if you have it). Heat your oven to 425F, or use 450F if you can. Roll/stretch out you pizza dough, and over with a layer of garlic sauce. Layer some gorgonzola down, as much or as little as you like (I am not a gorgonzola fan so I used as little as possible), put some mozzarella down, top with figs, and drizzle with a little bit of the truffle oil. I don’t have a pizza stone. I don’t think it’s necessary. 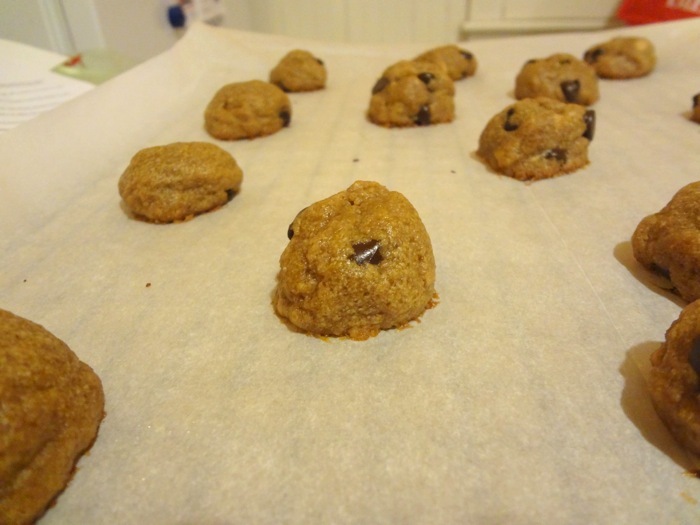 I like to either put down parchment paper on a cookie sheet, or use a well-oiled cookie sheet. Feel free to put some cornmeal on the pan if you have it, to keep the dough from sticking. Put the pan with the pizza on the bottom of your oven for 5 minutes to get a nice toasted bottom, and then move it to the middle of the oven to finish cooking. If at 450F, it’ll probably only take another 5 minutes to cook. If at 425F, I think it’s about an additional 10 minutes? I don’t know. Tammy and I just kept checking the pizza after what felt like an appropriate amount of time, instead of actually timing anything. At home by myself, I’m better about putting a timer on but that’s because I usually wander off to check my email. Photo below from Tammy Raabe Rao. What is this? An update? Really?! I will admit though that I’m posting at the request of a friend. haha, I’m so lazy otherwise or something like that. 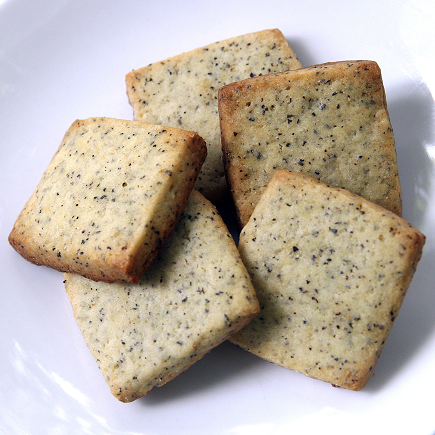 I’ve been experimenting with earl grey butter cookies. They aren’t perfect. The flavor is very subtle. I haven’t been able to keep these in my house long enough, but it’s been reported to me that the flavor improves after a couple of days. I’m still going to experiment – need to see if I can bump up the earl grey flavor a notch, but dang! they smell amazing when they are baking in the oven. Makes about 5 dozen? I don’t know. Uh… I must admit that I lost some of the dough to the floor. Cream the butter and sugar first. Then add the eggs and vanilla, and mix. Finally add the flour, tea leaves, and salt. Mix until well combined. Now, you can roll these into two logs and freeze them for at least an hour, or you can fill plastic bags and roll out flat before putting into the freezer. The first method gives you traditionally round butter cookies. The second gives you the chance to make very neat squares. I’ve done it both ways. After freezing, slice up your logs into about 1/4″ rounds. If you used the plastic bags, cut the bags open flat and cut your cookies into neat squares. Either way, your cookies should probably be about 1 1/2″ in size. Preheat oven to 375. Space cookies 1 inch apart on baking sheets lined with parchment. Bake until edges are golden, 18 to 20 minutes.